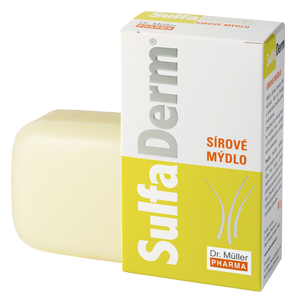 Sulfur-containing soap and shampoo are traditional products suitable for excessively greasy skin. They help to remove the skin grease and clean the skin pores. They are very gentle; they do not impair the skin moisture and balance. The products can be used frequently. • Soap effectively removes skin impurities, cleans the skin in depths and leaves the skin naturally soft. • Contained sulfur reduces sebum production, releases and cleans skin pores and reduces the formation of comedones. Use: Gently wash skin with soap and then rinse. To enhance the effect, you can leave a few minutes and then rinse only. Protect the eyes and mucous membranes! In case of skin irritation, discontinue application. Traditional sulfur-containing product is suitable for care for excessively greasy hair. It also influences beneficially itching scalp and dandruff formation. 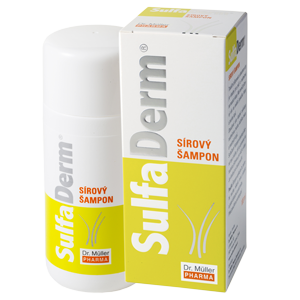 • Sulfur contained in the shampoo reduces excessive sebum and greasy dandruff formation. •SulfaDerm® Shampoo contains gentle washing ingredients. Its pH value is beneficial for skin and hair. •It can be used frequently. Use: Apply the shampoo twice. Let the second application act for several minutes and then wash your hair thoroughly. Unique product containing natural active substance – elemental sulfur. It is suitable for every day care for sensitive, excessively oily skin prone to acne. It releases skin pores and leaves the skin clean and soft. Tonic can be applied onto the skin of whole body, including face and scalp, where it prevents itching and dandruff formation. Use as often as needed. There is no rinsing required after use.